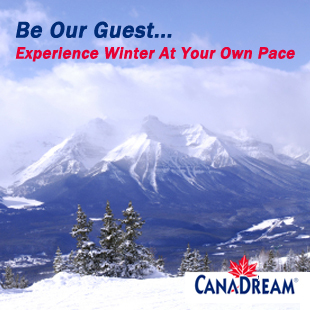 View suggested Canadian Badlands loop tour and attraction details. Erosion has been very significant in the Drumheller Valley, effectively turning back the hands of time, allowing us to peek into the past, as it was 65–75 million years ago. It is the very reason why there have been so many fossil finds in this region; the bones have been exposed to the surface once again. 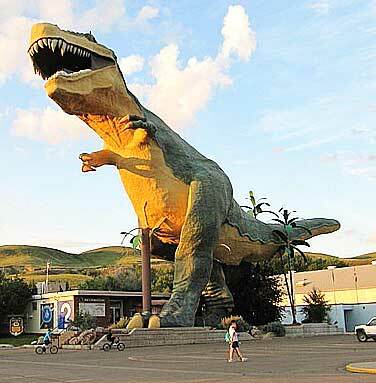 Residents have embraced their heritage, calling Drumheller the “Dinosaur Capital of the World!” A giant T. rex towers over their visitor centre. Known as the “World’s Largest Dinosaur”, the larger than life T. rex stands 86 feet tall. Open year-round, for a small admission fee, visitors can climb the giant T. rex and admire the badlands vista from inside the gaping jaws. Just remember to bring along your camera! Drumheller (Drum) is home to 2 of the 9 sites identified on Alberta’s Fossil Trail and makes a wonderful base for your dino adventure. 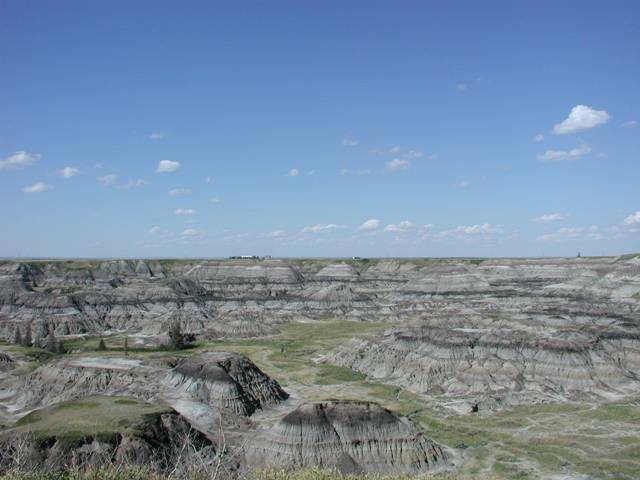 One of these sites is the unique Horseshoe Canyon, located 16 km west of Drum on Hwy #9. The bands of multi-coloured mudstones, coal beds and rock represent times of major climactic and environmental changes that would have greatly affected both plants and animals. For a better view, take the helicopter ride, or take a walk along the canyon trails. The other site is the world-famous Royal Tyrrell Museum, located just 6 km northwest of Drumheller, on the north leg of The Dinosaur Trail, a 48 km loop heading northwest out of Drum. 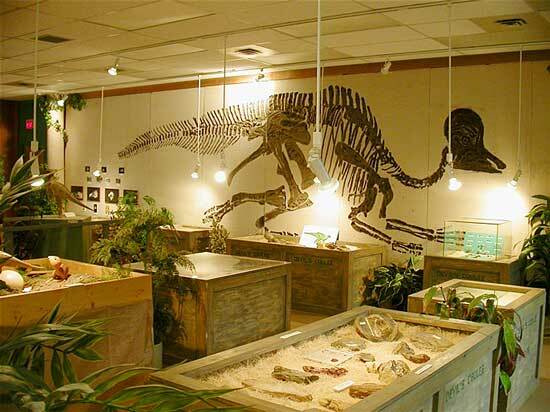 The Tyrrell`s Dinosaur Hall offers one of the world’s largest displays of dinosaur skeletons. Experience the underwater world of prehistoric creatures in the Burgess Shale and watch as staff members prepare fossils in the lab. Expect to linger here for 2-4 hours. The Dry Island Buffalo Jump Provincial Park is located 18 km east of Huxley, on Hwy #21, about 75 minutes northwest of Drum, and to the west of the Red Deer River. It too is one of the nine sites that make up Alberta`s Fossil Trail. From early May to late October, you can get there via the Bleriot Ferry which has been in operation since 1913. Dry Island represents the northern end of the Canadian Badlands. 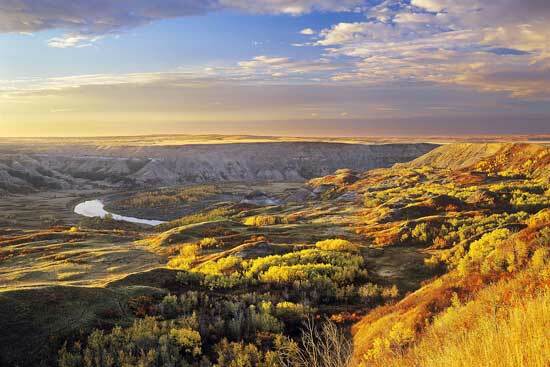 Rangelands collide with 50-metre cliffs on the banks of the Red Deer River. Autumn landscapes are particularly stunning. Back in Drum, explore the Fossil World Discovery Centre and Reptile World. There are many dining delights in Drumheller; if you like Greek, the Athens Restaurant will not disappoint. The Hoodoo Trail (Hwy #10) takes you southeast to several attractions including the Hoodoos (16 km) and the Atlas Coal Mine National Historic Site (24 km). Next up, a UNESCO World Heritage Site and one of the best kept secrets in Canada! 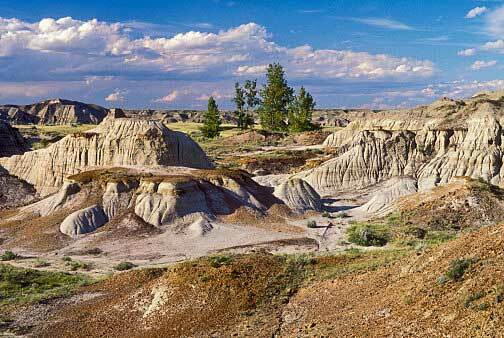 Dinosaur Provincial Park contains the highest concentration of late Cretaceous fossils in the world. Much of this park is only accessible with a guide, so reserve your programs in advance to avoid disappointment. Phone 403-378-4344. From the Atlas, take Secondary Hwy #570 east through Dorothy, until it merges with Hwy #876 taking you south to Dinosaur Provincial Park. A longer route with better roads is south on Hwy #56 from Drum to Hwy #1, making your way east to Patricia. Our next destination is Warner, Alberta, but you may want to take a side trip to Medicine Hat (The Hat) first for supplies. If you take this side trip, follow Hwy #1, and pay particular attention to the cliffs along the South Saskatchewan River in The Hat. Here, fossils from animals and plants have been found giving evidence that over the past million years, sabretoothed cats, giant sloths, mammoths, and even American lions have lived in this locale. To get to Warner from Medicine Hat, take the Crowsnest Hwy (#3) west to Taber and #36 south. If you head directly to Warner from Dinosaur Provincial Park, get onto Hwy #36 and follow it straight south til you get there and the home of the Devil’s Coulée Dinosaur Heritage Museum. This museum contains ancient fossils, dinosaur models and a mural depicting a hadrosaur (a duck-billed dinosaur) caring for its nest. You may wonder why hadrosaurs lived in such an arid climate, but remember millions of years ago, the prairies was covered by the Western Interior Seaway. This body of water stretched from the Gulf of Mexico to the Arctic Ocean! As the water gradually receded, ancient Alberta’s balmy climate produced lush forests, wetlands and coastal plains, an environment wellsuited for a duck-billed dinosaur.